It continues to rain almost every day. Our meadow garden is WET… standing water wet… and the cucumbers and squash are producing like crazy. We’ve been trying to pick around the edges so we don’t damage the plants, but this morning I waded (literally) into the mass of plants and picked… and picked… and picked. This photograph shows only a few of the cucumbers. And then there’s the squash… my dining room table is almost completely covered with piles and piles of cucumbers and squash. I’ll take care of the cucumbers first. Some of them are larger than I like, but they will be fine for our favorite cucumber relish. 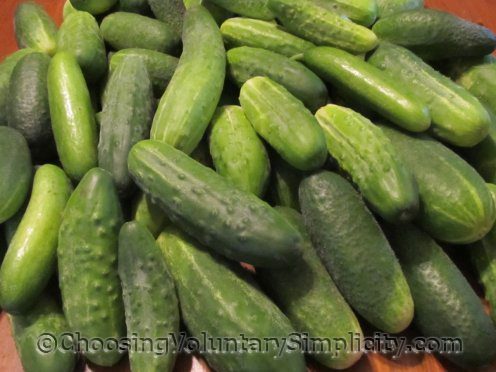 I’ll use the smaller ones to make sweet pickles. And then I’ll tackle the squash. I’m making cucumber relish today too and I’m using your recipe – but I only have a few cucumbers. I made some last week too and it already tastes wonderful. I also want to make your pickles. did u ever notice how huge amounts of vegetables seem to be ready at just the most inconvenient times?? i’m not complaining because we really value the fresh vegetables we harvest from our small garden but i can’t tell you how many times i have found myself with lots of cucumbers or tomatoes and no time to deal with them. i agree though, gardens are wonderful. Ooooooo! I’m envyous! All those fresh veggies to have! That’s my dream. Someday a garden and a country life. I really like your blog. Thank you for all you do!